United Way of Oswego County extends a sincere thank you to the many volunteers and sponsors whose commitment to the United Way 2015 Golf Tournament again made the event an outstanding success. This year’s golf tournament, again featuring morning and afternoon flights, hosted 42 teams and raised more than $26,000. This money will be used to help fund the many human services programs, provided through our member agencies, that work to end hunger, help children and youth succeed and improve the overall health and well-being of our communities. An event of this scope requires year round preparation. United Way acknowledges the excellence in planning and organization demonstrated by our Golf Committee. These dedicated individuals, including Chairperson John Nelson of Nelson Funeral Home, Dave Lloyd of Novelis, and Kim McPherson of Eastern Shore Associates, did an outstanding job in implementing their vision for this tournament. 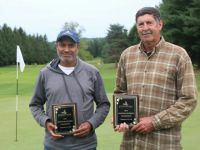 Their efforts, combined with the graciousness and support of the Oswego Country Club management and staff, ensured an enjoyable day for golfers and volunteers. The United Way Golf Tournament would not have been possible if not for the support we received from our major sponsors, Exelon Generation, Entergy James A. FitzPatrick NPP, Novelis, National Grid, Planned Results, Inc., and Burritt Motors, as well as our beverage and food vendors Eagle Beverage, David Mirabito with MetLife, and Atom and Felicia Avery of the Beacon Hotel. It’s also unmistakable that the day would not run as smoothly as it did if it wasn’t for our volunteers that worked hard throughout the entire day. Good people coming together for the benefit of others is the trademark of United Way and nowhere was that more evident than our 20th Annual Golf Tournament. Thank you for your continued community support of the United Way.